Blogging Blues Update: It all started when I connected my new cell phone into my computer...I just wanted to download some photos that I took from last weekend's trip to NY from my phone to the computer and my husband and I are not sure how to exactly do this. We were not able to download any pictures and now my computer won't recognize and read my memory card from my digital camera so I can't upload any new pictures from my camera or phone! I am so frustrated, but there are bigger problems in this world and I am not going to stress about this petty problem, but I am still frustrated! It's ironic that during the amidst of all this computer trouble a friend told me about a young mother who was 21 weeks pregnant with her third child and just passed away this week from cancer. Then another friend told me that her husband's cousin is in need of prayer because the cousin is a Catholic homeschool mother of 6 children with her youngest under 1 year and she just found out she has lung cancer, which is a total shock being that she is not a smoker. So these stories from friends of young mothers and their families who are in need of prayer really put life and my blogging blues in perspective. While praying for all those who are in need, I will also pray that my computer inconveniences will get resolved because I want to blog about so many things, like my recent trip to NY when I saw my dad get inducted into his high school's hall of fame for basketball. I like to include pictures with my blog posts, so I hope to get this issue resolved quickly, especially since I will be going out of town again this weekend and I'll have even more pictures to download to my computer! So hang tight while I get my technical difficulties fixed and have a Happy Wednesday! Click button below to join Lynda, Anna-Marie and I for the No Ordinary Blog Hop for the entire month of January:) The blogger who posts the most will be spotlighted next month and be given a Star Blogger Award. Come join the FUN!! Technology is great, but when it doesn't work it's so frustrating!! I second Jen's comments. I will be praying for all those you have listed as well. Such terrible tragedy!!! Are you able to send the pics to Facebook and "save as" from there? Your examples of life's true trials and tribulations have humbled me this morning. I will pray about those situation. I also wanted to ask you...is the day in our life blog hop something that can be done on any day of the week? I agree and I don't know much about computer troubleshooting so I'm always asking my husband to help! Thanks for your visit and comment! 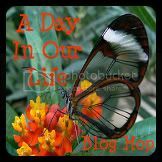 Thank you for linking your post to A Day In Our Life Blog Hop. I will be praying for the two ladies you mentioned. I hope your blogging blues don't last long. I will add a pray for that too. Have a wonderful day, and I voted for you. Thank you for your visit, comment and prayers! Your prayers are greatly appreciated! I know, I should ask my 3 year old since she may be able to figure it out before me :) LOL :) Thanks for your visit and comment! I don't know about the Facebook thing? I haven't tried that before. Thank you for your prayers too! Yes, the Day in Our Life Blog Hop is done on any day of the week and you can link up as many posts from Saturday to Saturday. Then each Saturday, Lynda at My Heart's Desire, who started this blog hop will start a new linky list and you can again post as many posts as you want on any day. Hope that helps! I love your Day in Our Life Blog Hop and I enjoy linking up to it :) My husband found a temporary fix to our computer problem with my memory card not being able to be read off my camera so I hope to download pics in a near future blog post! Thanks always for your visit, support and comments! My husband was able to figure out a temporary solution to the downloading picture problem. Thanks for your prayers! My heart just breaks for those families. Sometimes things are really put into perspective for us. I voted for you today, Tracy! I look forward to reading your next post. Have a wonderful day. Thank you for your blog visit and comment! Hearing stories of such suffering makes me not take so much for granted! Thanks Lynda for your continued support, visits and comments! I hope you are having a great day!